Before getting after some technical writing this morning (only to be later usurped by some Dakota language studies), I thought I’d link to some forthcoming scholarly analyses on the cultural movement of Punk in all of its unadulterated filth and fury. You can read about the soon-to-be-realeased Punk Archaeology anthology here, and about a work of Punk Sociology here. It was great this morning to come across a local story of a proto-punk Jonathan Richman, who is getting ready to play the Aquarium in downtown Fargo, North Dakota this next week too. On this single-chord punk note, it’s appropriate to mention the passing of one of the first proto-punks, as memorials and obituaries on Lou Reed have been popping up all over the place (here, here, here and here). This shouldn’t eclipse the passing of folk punk hero Phil Chevron (aka, Philip Ryan of The Pogues or The Popes, depending on the year) in early October 2013. A sad reality for sure, and a time for reflection and contemplation. 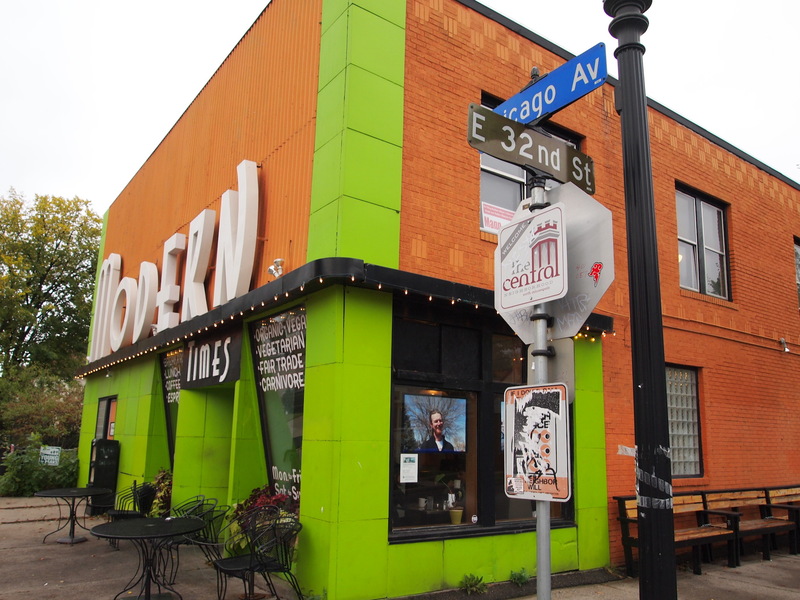 An October 19, 2013 photo of Modern Times Cafe. 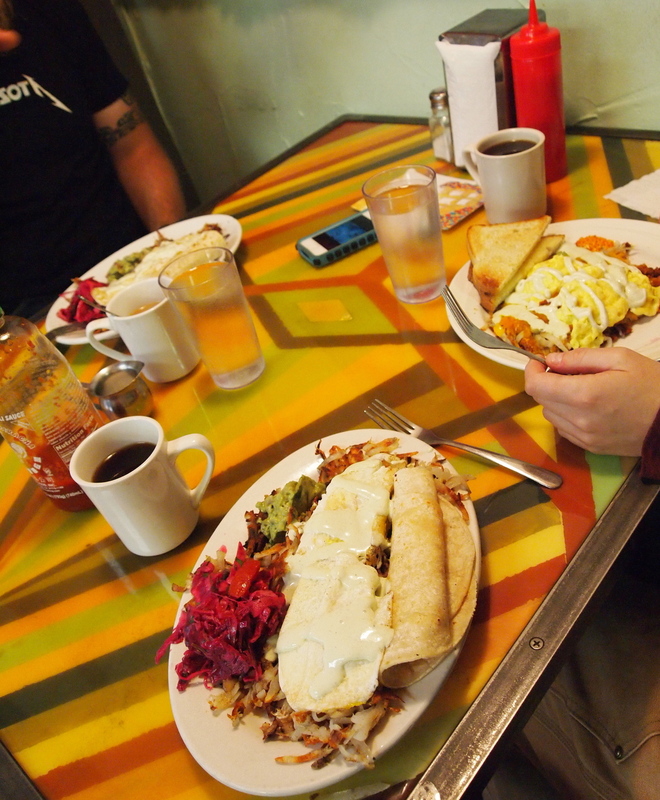 Delicious, sensibly priced breakfast from Modern Times Cafe. 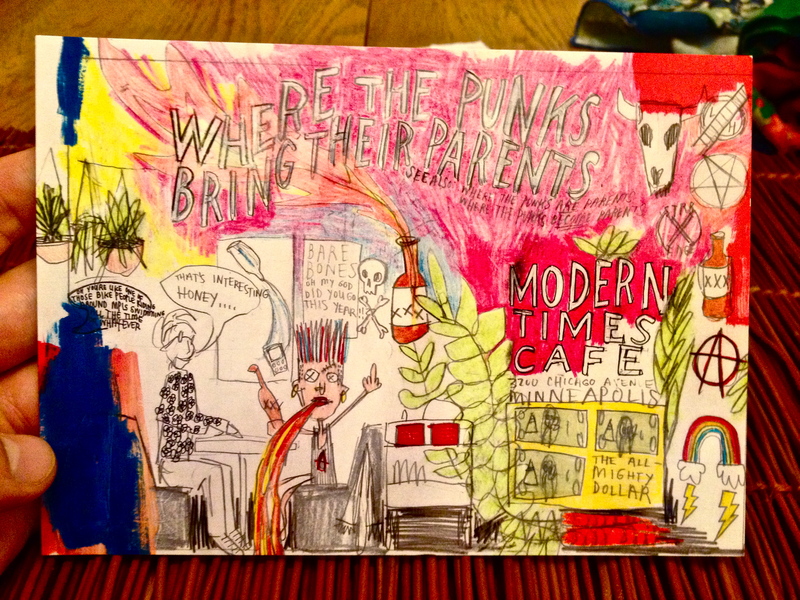 A Modern Times Cafe postcard indicating that this is a place where punks bring their parents. This entry was posted on Thursday, November 7th, 2013 at 8:59 am	and tagged with Archaeology of Food, Fargo, Grand Forks, Jonathan Richman, Minneapolis, Minnesota, North Dakota, Punk Archaeology and posted in Uncategorized. You can follow any responses to this entry through the RSS 2.0 feed.